Apples BBC v Sintra, Portugalsko: Zarezervujte nyní! Apples BBC is a new hostel on a traditional beach house, recently refurbished, modernized to be cozy, simple and relaxing. There’s free WIFI available throughout the property and a comfortable lounge-bar where you can have a beer or tea while surfing the web and charging your gadgets. At your service, there is a fully equipped kitchen with free coffee and tea all day, and a shared toiled with hot showers. Laundry service with washing and drying is also available. The property is located in the center of Praia das Maçãs, a few minutes walking away from the beach, natural-water swimming pool, clubs, the surf-school, football and tennis courts, grocery shops and the tram/bus stops. A nice hike away by the beach and shore, there is the famous Praia Grande, notorious for its surf reputation, night-life and dinosaur-fossil rocks. Hike the other way around and you’ll find the amazing cliffs of Azenhas do Mar, considered by many one of the most spectacular places in Portugal. The center of Sintra, the historical village, is also easily reachable through the touristic tram departing right from our door. 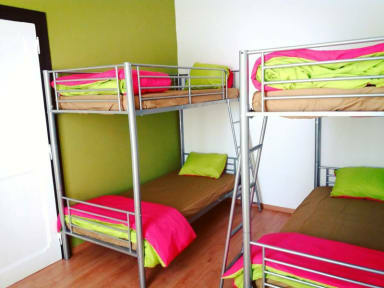 We offer different types of accommodation for different sort os travellers (dorms and private accommodation options). 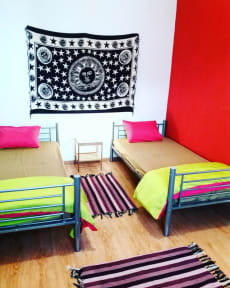 In the hostel we value and promote respect, peacefulness, quietness and harmony, so we hope you don’t mind our chill-out decoration, the fragrance of a burning incense or a smooth jazz playing in the background. Put on your flip-flops, grab your beach towel, and enjoy the beach! Not on a beach day? That is cool: take a bike and ride (or just walk!) and explore the surrounding coast all the way to the amazing Azenhas do Mar or go even further to the wild Aguda.